Yangon, Burma, Nov 28, 2017 / 08:03 pm (CNA/EWTN News).- Encouraging Burma’s minority Catholic community on Wednesday, Pope Francis preached the forgiveness and compassion of Christ in the face of violence and injury. “I know that many in Myanmar bear the wounds of violence, wounds both visible and invisible. The temptation is to respond to these injuries with a worldly wisdom that … is deeply flawed. We think that healing can come from anger and revenge. 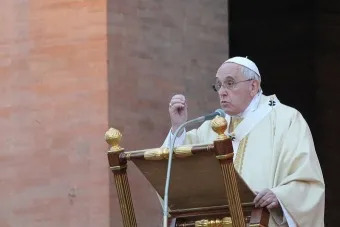 Yet the way of revenge is not the way of Jesus,” the Pope said during his homily at Mass Nov. 29. 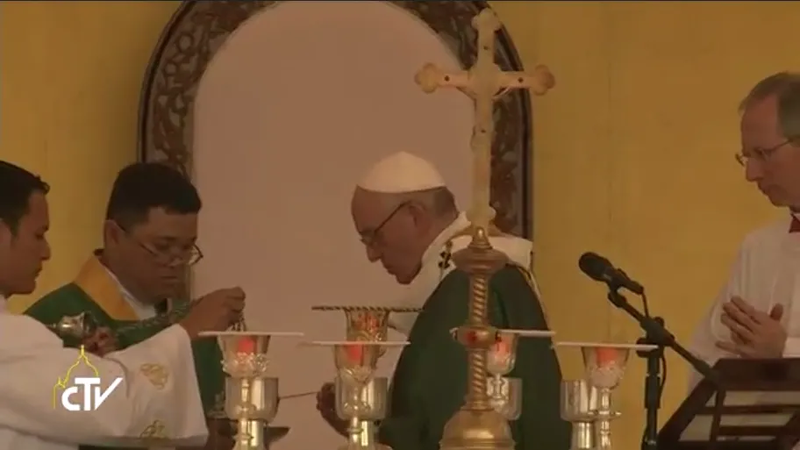 Christ “responded with forgiveness and compassion” when “hatred and rejection led him to his passion and death,” Francis reflected during the Mass, said at the Kyaikkasan Ground in Yangon, the largest city of Burma (also known as Myanmar). “By the gift of his Spirit, Jesus enables us each to be signs of his wisdom, which triumphs over the wisdom of this world, and his mercy, which soothes even the most painful of injuries,” the Pope added. Francis arrived in Burma Nov. 27, and has already met with military and government officials and with religious leaders. He will remain in the country until midday Nov. 30, when he will travel to neighboring Bangladesh. Burma was ruled by a military junta for 50 years, and has only recently begun a transition toward democracy. International attention has focused recently on the Rohingya, a predominantly Muslim ethnic minority who have been denied citizenship and general persecution. In recent months, more than 600,000 Rohingya have fled the country for Bangladesh amid state-sponsored violence against them. The country’s Christian minority (about one percent of the population) has also faced persecution from the government and the Buddhist majority. The US Commission on International Religious Freedom reported last year that Burmese Christians face discrimination, forced conversions, violence, and the desecration of churches. Pope Francis’ words to the country’s Catholics have, therefore, a certain poignancy to them. “Many of you have come from far and remote mountainous areas, some even on foot. I have come as a fellow pilgrim to listen and to learn from you, as well as to offer you some words of hope and consolation,” he told them. Vatican City, Aug 5, 2017 / 09:42 am (CNA/EWTN News).- On Saturday, Pope Francis made several changes in the Syro-Malankara Church, found predominantly in India, establishing a new eparchy and naming several new bishops, as well as an apostolic visitor. Announced in an Aug. 5 communique from the Vatican, the Pope has officially established the Eparchy of Parassala, a small village in the Kerala region of India, and named Bishop Thomas Mar Eusebios Naickamparambil as its bishop. Bishop Naickamparambil was previously in charge of the Eparchy of Our Lady Queen of Peace for Syro-Malankara faithful in the United States and Canada. Taking his place will be Bishop Stephanos Thottathil, who until now has served as auxiliary bishop of Tiruvalla, in India’s southern state of Kerala, which is predominantly Christian. An eparchy is similar to a diocese for Eastern Churches. 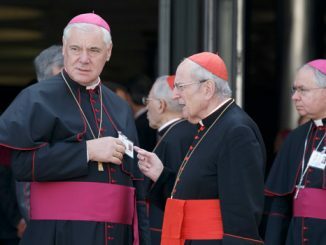 The Syro-Malankara Catholic Church itself is one of the 23 “sui iuris,” or “independent” Eastern Catholic Churches in full communion with the Catholic Church and the Bishop of Rome. Cardinal Moran Mor Baselios Cleemis is the current Major Archbishop of the rite, and is also President of the Catholic Bishops Conference of India. In addition to the establishment of the Parassala eparchy and the nomination of its bishop, Pope Francis named Fr. George Kalayil as Bishop of the Eparchy of Puthur, also in Kerala. He had previously served as a priest in the same eparchy. The Pope also named Fr. John Kuchuthundil as a Curial Bishop and Apostolic Visitor to the Syro-Malankara Church in Europe and Oceania, although no specific reason for the visitation was given. Bishop Thottathil, who will be taking over the Our Lady Queen of Peace eparchy for the U.S. and Canada, was born in the Pathanamithitta district of Kerala May 9, 1952. He was ordained a priest in 1979, and after serving in various parish assignments, he obtained a doctorate in moral theology from the Alphonsian Academy in Rome. He then returned to India, where between 2003-2005 he served in various roles, including Vice-Rector of his diocese’s Minor Seminary, Head of the Mission to Delhi, Director of the Pushpagiri Hospital, Professor of Moral Theology, Dean of Theology and Rector of St. Mary’s Malankara Major Seminary. He was consecrated auxiliary bishop of Tiruvalla March 13, 2010. Bishop Naickamparambil, who will head the new eparchy in Parassala, was born June 6, 1961, in Mylapra, and was ordained a priest in 1986. After completing his initial studies in philosophy and theology, he went on to earn his doctorate in philosophy in Rome. He speaks Malayalam, English, German, Italian and Hindi, and can read Syriac, Greek and French. Following his priestly ordination and studies, Naickamparambil served in various roles, including: Vice Pastor and Pastor of several different parishes, Professor and then Dean of Philosophy at St. Mary’s Malankara Major Seminary, Public Relations Officer, Coordinator for interreligious dialogue and Secretary of the presbyteral council, Director of the Sarvodaya Vidalaya school and Treasurer of the Mar Baselios College of Engineering and Technology. He was named bishop in 2010 for the Syro-Malankara faithful in the United States, and, at the same time, named apostolic visitor of faithful living in Canada and Europe. According to the Vatican communique, the new eparchy of Parassala that Bishop Naickamparambil will oversee has some 30,750 Syro-Malankara faithful in addition to 220,000 Christians of other rites in the area, which has a total population of roughly 952,500 people. Overall, the pastoral care of the Syro-Malankara faithful is entrusted to some 22 eparchial priests in 95 parishes, in addition to various religious brothers and sisters, such as priests from the Order of the Imitation of Christ, the Franciscans, Daughters of Mary sisters, Sisters of Imitation of Christ and Sisters of the Sacred Heart. In total, the Syro-Malankara Church manages more than 50 educational institutions, including 10 high schools. With lifelong rule by Xi Jinping, how will Christians fare in China? Seoul, South Korea, Jul 6, 2018 / 12:01 pm (CNA/EWTN News).- The Vatican’s top diplomat expressed hope Thursday that efforts to bring lasting, stable peace on the Korean peninsula will bear fruit. “We don’t have any doubt that there will be many challenges and many difficulties ahead, but the determination that the Korean people have always shown in determining their future, I am sure with the prayers and support of Christians and other men and women in good faith around the world that many good things will be achieved in the coming months. 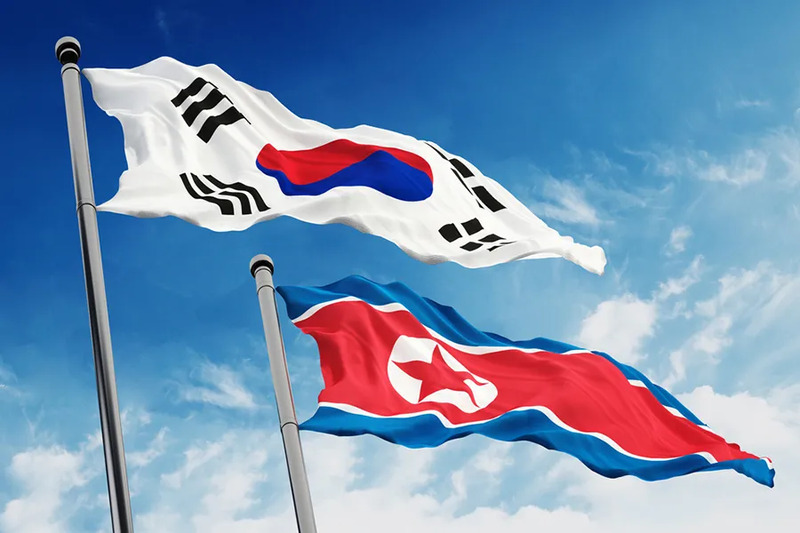 We pray for that,” Archbishop Paul Gallagher, Vatican Secretary for Relations with States, said July 5 at the Joint Security Area on the Demilitarized Zone between North and South Korea. Archbishop Gallagher arrived in Seoul July 4 for a six-day trip to South Korea on an invitation from the country’s government. In addition to visiting the DMZ, he will meet with President Moon Jae-in and Foreign Minister Kang Kyung-wha. Archbishop Gallagher, touring the Joint Security Area, said, “it is a very historic period, a period of hope and the Holy Father is supporting that movement.” The area is the one portion of the DMZ where North and South Korean soldiers stand face-to-face, and it is used for diplomatic meetings between the countries. He said he is “sure that there will be much good that will come in everything that is happening throughout the Korean Peninsula” and among their international partners. “What is surprising is that the division of only six or seven decades turned what was previously one country into very different nations. I was freshly reminded that we have so much to do about that,” he added. The archbishop called on Catholics to “mobilize every possible (opportunity) to make peace” between the Koreas.